Since it’s starting to warm up a little I decided I better get my last good soup days in. Don’t get me wrong, I still eat soup all summer long, not quite as frequently, but it is much more enjoyable on a cold snowy day or a cloudy rainy day than it is on a hot, sunny summer day. 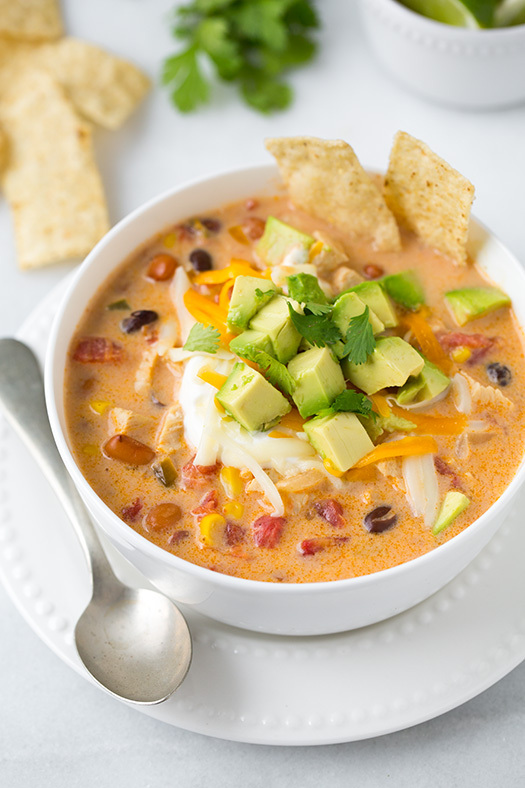 I think of this soup as a hybrid of two southwestern soups that I love, this Slow Cooker Chicken Tortilla Soup and this Chicken Enchilada Soup. But, this one has something neither of those do – the creaminess. Aren’t creamy soups the best? Especially when they are smothered with a generous helping of cheese.